Forget about peeling back the layers - today we're gonna talk about adding layers. When you find an API that looks interesting, you'll naturally want to try it out. I've tested and written quite a bit about APIs, and most of the time I start off with a tool like Postman. That's fine for playing around, but eventually you'll want to use it in your app. APIs come in all shapes and sizes. Some are dead simple; others are amazingly complex - even overly complicated at times. It takes time to implement it in a language - to figure out the right way to access any REST endpoint, then to figure out the right way to access a specific endpoint and get the data you're interested in. As long as you're doing all that work, why keep it to yourself? You can share the work you've done - maybe elaborating to cover all of an API's endpoints, or maybe letting others make pull requests to fill in the gaps. Hopefully the language you're using has some concept of a library, package, or some other way to bundle code up for easy sharing, but that's not necessarily necessary. Several weeks ago, I wrote a few one-off Python scripts to demo accessing the ISS Notify API. I won't repost them here, but go check them out before looking at how we can refactor them. Notice how much code is duplicated between them. What if we wanted to make another call to the same endpoint? Or a call to a closely related endpoint? Or 10 more calls with different parameters? And what if someone else wanted to make the same calls as you but wasn't sure where to start? Maybe we can help them out. What I call an API wrapper is really quite simple - just some nice, clean functions to access the API, published somewhere accessible like GitHub. Tada. Here's two of the Python scripts from the other post, refactored into a single file that I named iss_api_wrapper.py. Now you can share your nice module / API wrapper with the world. If the API endpoints change in the future, you can change the calls being made in your Python code, but anyone using your module will be none the wiser! Let's try the same thing one more time, in C# this time. I wrapped all three examples from the ISS Notify API post. This code depends on the RestSharp NuGet package (just discovered it; made accessing the endpoint simple) and some classes I had to defined but didn't want to paste below - you can find everything on GitHub. You can see the original JSON output from the API here. And now you've got a nice wrapper that anyone can download and use, without them having to know exactly how the ISS Notify API looks, or rethink the same logic you already spent time coding. The next ISS pass for 41.4984174 -81.6937287 is 1/25/2018 3:23:45 AM +00:00 for 563 seconds. What do you think? 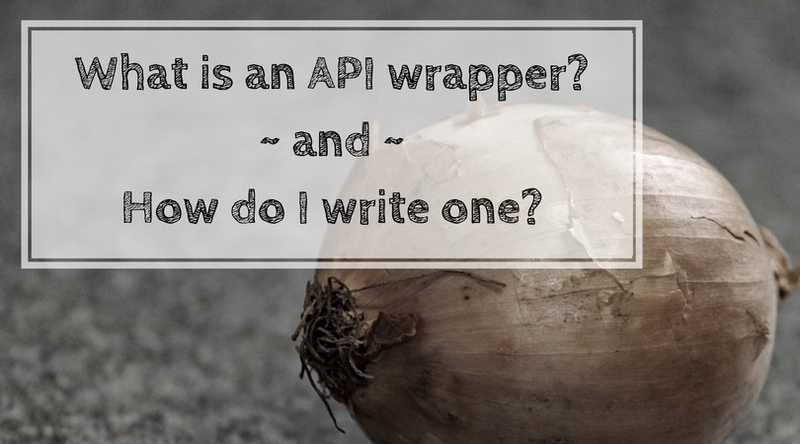 Are you working on an API wrapper, or thinking about it? I'd love to check it out - let me know below, or just share your thoughts!